Kartemquin is thrilled to share that First Look Media’s entertainment studio, Topic Studios, has acquired the streaming rights for our Oscar-nominated documentary short, Edith+Eddie, for their digital storytelling site, Topic.com. 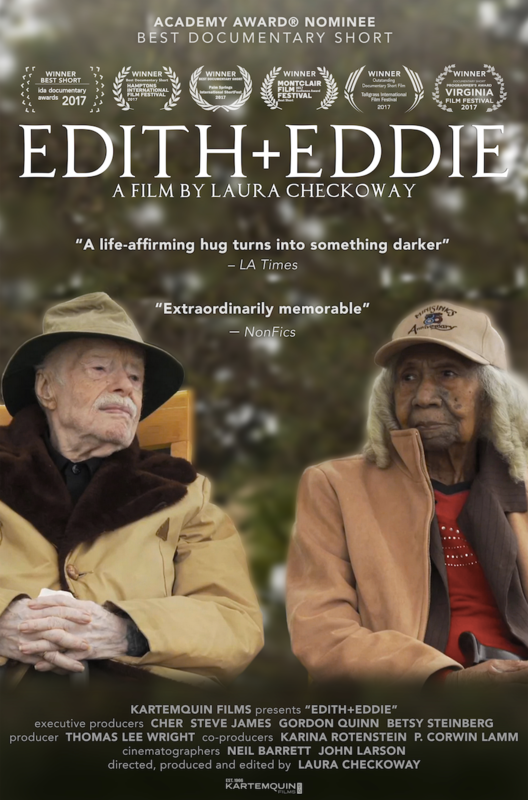 Edith+Eddie, directed by Laura Checkoway (Lucky), follows America's oldest interracial newlyweds at age 96 and 95. Their love story is disrupted by a family feud that threatens to tear the couple apart. Millions of American families go through elder care disputes and guardianship cases. These cases are life altering, emotionally and financially depleting, and dealt with in isolation. The film is produced by Laura Checkoway and Thomas Lee Wright, co-produced by Karina Rotenstein and P. Corwin Lamm, and edited by Checkoway and Lamm. Academy-Award nominee Steve James (Abacus: Small Enough to Jail), Gordon Quinn, and Betsy Steinberg are executive producers for Kartemquin, alongside singer and Academy Award winning actress Cher, who initially saw Edith and Eddie’s story in a news report and has been actively supportive of the couple and the film ever since. Prior to being Oscar-nominated, Edith+Eddie won Best Short at the 2017 International Documentary Association Awards, as well as Best Short prizes at the Hamptons International Film Festival, Virginia Film Festival, Palm Springs International ShortFest, Tallgrass Film Festival, Rhode Island International Film Festival, Nevada City Film Festival, and the audience award at the Montclair Film Festival.